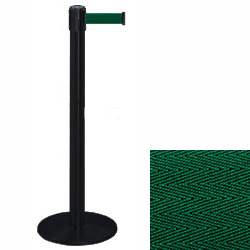 This black stanchion w/ green belt is the highest quality crowd barrier system on the market. 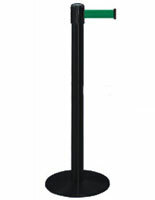 This line queuing system features a 7.5' satin rope and sturdy metal post. 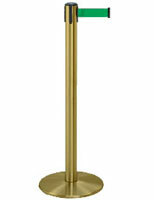 This stanchion with green belt and a 13.5"d weighted base remains stable in high traffic. The 24 lbs. unit is easy to move around venues, too. 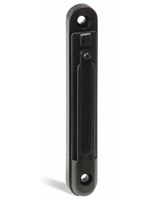 These stanchions are most effective when placed no more than 7' apart. For your areas of high traffic, we recommend using Dual Belt Posts. For assistance regarding layout options, click designing crowd control systems.